Besieged by fans and guarded by police the four Beatles painted an abstract painting together, whilst holed up in the Tokyo Hilton, Japan 1966. To mark this fabulous event’s fiftieth anniversary, unofficial “Beatles”-type toys, gonk and puppet, survivors from the sixties , have attempted to reproduce that painting. 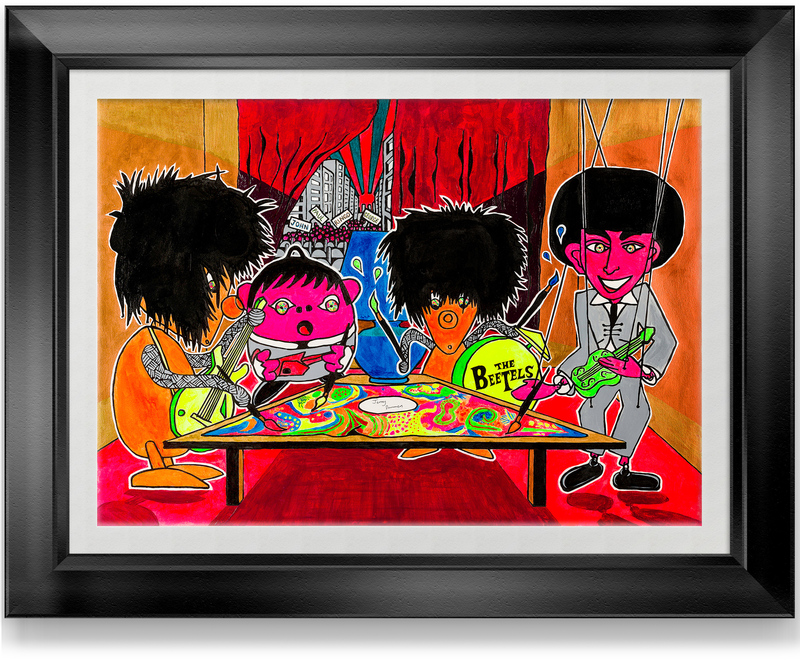 Is this handpainted screen print by Jerry Dammers (founder of The Specials and 2 Tone records), a comment on musicians turned into consumer items and bootleg merchandise, through no fault of their own ?….. a comment on The Beatles’ escape into psychedelics from a red carpet gilded cage ? ……. a comment on Japan’s post Hiroshima embrace and miniaturisation of all things western?…….. or just a piece of colourful sixties fun? You decide. Well? Which one is it?